Today I am discussing Kathi and my 2015 Christmas adventure. 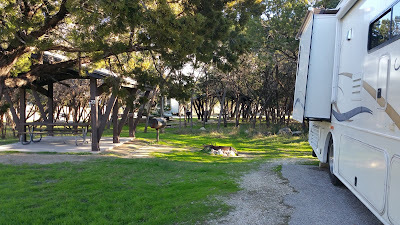 We have been staying at Green Caye in Dickinson, TX for the last year, so Kathi and I decided to get out of town for a few days and spend Christmas at Cedar Breaks Park on Lake Georgetown. The weather was great, so it seemed like a good time to travel. The evening of Saturday night on December 12th I logged on to recreation.gov and found us a site available at Lake Georgetown, for the period of December 22-27. A couple of days later we discovered we could get away sooner than the 22nd, so Kathi got back on recreation.gov and scheduled us December 17-21. 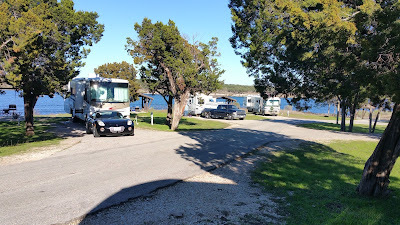 She tried to get the same site I had booked, but it was not available, but we did find one nearby that still allowed us to look out the windshield of our motorhome at a lake view. We took our normal route, north on Texas 146 from Bacliff to La Porte, then west on Texas 225 until we got to Loop 610. We went north on the Loop and then west around the Loop to where it meets US 290. Then we went WNW on 290 through Jersey Village, Prairie View, Hempstead, Chappell Hill, Brenham and Elgin. We left US 290 about 10 miles east of Austin and took toll road Texas 130 until it dead-ended at I-35. A mile or so north on the I-35 feeder we turned back west on Texas 195 for a couple of miles, then south on Shell Road to Cedar Breaks Park. There was a lot of construction beginning where US 290 intersects the west side of Loop 610 and the construction went on for miles and miles. The narrow lanes are nerve racking for me driving the RV, as I had to pay close attention to staying in my lane. That’s not too bad for 5 miles or so, but it gets more tedious the longer it goes on. Kathi winced each time we passed an 18-wheeler or they passed us. She claimed she could touch them from her window. I did not think it was that close, but it was okay with me when she suggested a different route home. Panning to the right from my front door. We spent the December 17-21 in site 26 at Cedar Breaks. 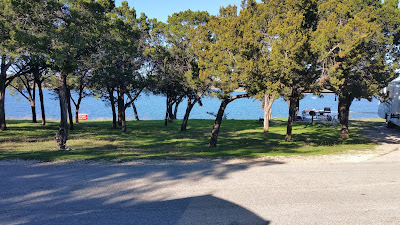 We spent most of our time inside the RV enjoying the view and relaxing. The weather was great and I enjoyed walking around taking a few pictures of the lake. We were running low on propane, so on Tuesday when we moved to site 22 we drove the RV west on Texas 29 to Liberty Hill and filled up our propane tank, then returned to Cedar Breaks. Christmas dinner consisted of ham, dressing, mashed potatoes and gravy. It was a great meal and I had two helpings. I was too full for desert, so pecan pie had to wait until just before bedtime. 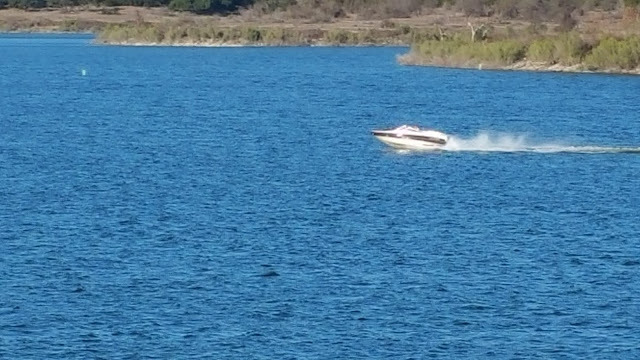 A speedboat moving across the lake. Campers at Jim Hogg Park across the lake. For our return trip we used TX 130 south then turned east on TX 71 through Bastrop, Smithville, La Grange and Columbus. We tried to go to the Buc-ees in Bastrop, but it was too crowded. There were two left turn lanes into Buc-ees and both were full and had traffic blocked for a mile behind us. We skipped the Buc-ees experience for this trip – maybe next time. The good thing is Kathi liked the new route much better, so that will be the route we take for future trips from the Houston area to the Austin area. It was nice being together and enjoying Christmas. I think the short trip also gave Kathi confidence that I had a few more driving miles in me, so we can continue the RV lifestyle. 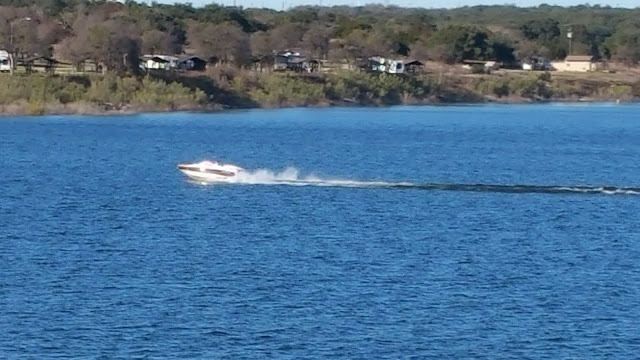 Boat is moving right along.